#257 - Gotham - "Before the Legend"
One of the first cases Jim Gordon pulled as a Gotham City police detective was the murder of wealthy citizens Thomas and Martha Wayne. Meeting their orphaned son Bruce at scene of the crime, Gordon swore to the boy that he would catch the Waynes' killer. Oh, Jimmy, you shouldn't make promises you can't keep. Even if you don't know you won't be able to keep them. Gotham's Det. James Gordon is played by Ben McKenzie, who's best known for playing another police officer in the TV series Southland - it's like he's actually working his way up the ranks! The likeness is pretty good, for a face that doesn't have a nose, and even his haircut is accurate. It's hard to tell if the hair is a new piece or not, because it's such a generic style. 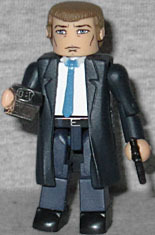 He's wearing a black coat and a blue necktie, and his belt is painted on. He comes with a black gun, and a badge. Gordon is paired in this set with young Bruce Wayne, who's looking emotionally dead. [Thereby making him the same as every other Bruce Wayne? --ed.] This is actually the third Minimate Bruce, thanks to the Stealth Batwing and Batcave C3 sets, but it's the first one to have the face of David Mazouz. He's wearing a Gloverall duffle coat, complete with hood. He's built using the "child" bodyparts, to keep him smaller than Gordon. For the most morbid play pattern ever, he comes with a second screaming head, and replacement arms with bloody hands, as though he'd just been kneeling over the bodies of his parents as they lay cooling on the pavement. A lot of people complain about Gotham, because "why would I want to watch a show about 8-year-old Batman?" Well, it's not a show about Batman, - it's not supposed to be. It's just a police procedural that happens to be set in a city from DC Comics. In fact, it's at its best when Bruce isn't even involved. But this set, with Det. James Gordon and Bruce Wayne, is a nice way to introduce the line. This entry was posted in Art Asylum, DC, MMMR, SDCC and tagged Batman, Minimates. Bookmark the permalink. I take it you weren't a fan of The O.C.? Since I wasn't a 12-year-old-girl in 2003, no, I've never seen it. Was his character important? That's the downside of IMDB: it can tell you every show someone was on, but can't say whether that role mattered. I find it funnier that he voiced Bruce/Batman in Year One! I seem to recall it having debuted immediately preceding the first episode of House, M.D., which, if I was a twelve year old girl (and I'm not saying I'm not) would have made for the dreamiest night of the week. But, yes, his character was the central fish out of water bringing drama and fulfillment to Mischa Barton and Peter Gallagher's eyebrows. Wasn't he opposite Bryan Cranston's Jim Gordon in that? The OC was on Fox? I thought it was CW. Then what am I thinking of? There's no way House and The OC debuted at the same time. The OC was way earlier. Huh, closer than I thought, with OC being summer 2003 and House being late fall 2004. Closer than I expected, but I believe farther apart than you did. "It's just a police procedural that happens to be set in a city from DC Comics." And feature all of Batman's villains, with no Batman. I predict Smallville complex. By series end there will be nothing for Batman to DO, the same way Smallville did all the big Superman plots before Clark became Superman.